Finding information about “Bali” is a lot easier these days, thanks to Julia Roberts’ new movie “Eat Pray Love”, part of which was filmed in Bali. To give a little background, the movie is based on Elizabeth Gilbert’s NY times best-selling book, also titled “Eat Pray Love”. The story is about the author’s journey to Italy, India and Bali, trying to find herself and the purpose of her life. Elizabeth enjoyed “Eating” and had a relationship with food while she was in Italy, found spiritual life, “Pray”, while she was in India. And finally she found balance, “Love”, while she was in Bali. The Bali part of the story took place in Ubud, a small town in central Bali, regarded as the cultural central of Bali. Far removed from beach area, Ubud is famous as an arts and crafts hub and consists of artists’ galleries and workshops. 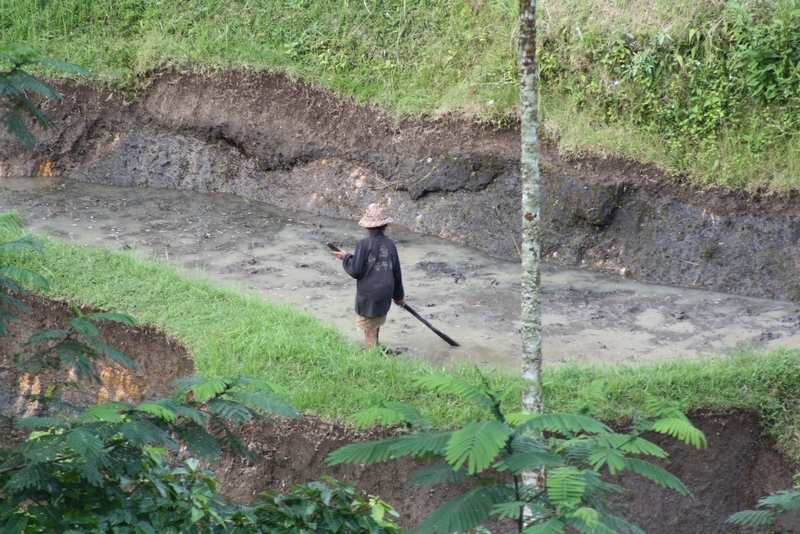 Ubud is a place rich with culture and spiritual significance. Also known for its spas, Ubud offers a beautiful view of rice paddies, and plenty of activities such as rafting, biking, tracking, or yoga. During the filming and especially before the opening of the movie, Bali was in the news almost everyday. The news coverage include topics such as helicopter scouting for a shooting place and the hotel where Julia Roberts and her family stayed. And certainly I could see the impact of it during our stay in Bali. The hotel that we stayed, “Ayana Resort”, which was voted as world no. 1 spa, even offered ‘Eat Pray Love’ message. 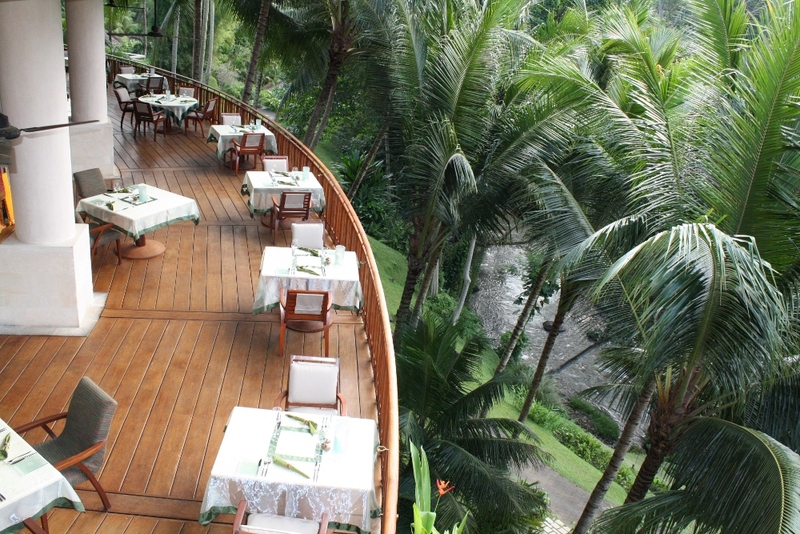 The Four Seasons resort in Ubud was later revealed as the choice for Julia Roberts and her family to stay. The resort is located in the valley of the tropical jungle. The villas offer a lot of privacy, and each is uniquely designed to blend with nature. As Ubud is known for its rice terrace fields, Four Seasons carefully built the whole resort around it. Taking a golf cart to get from one villa to another, you’ll see rice fields along the way. Once you reach the villa, you’ll see only a beautiful crafted screen that is used as an entrance to the villa which is situated on the hill-side. This clever architecture design allows absolute privacy. 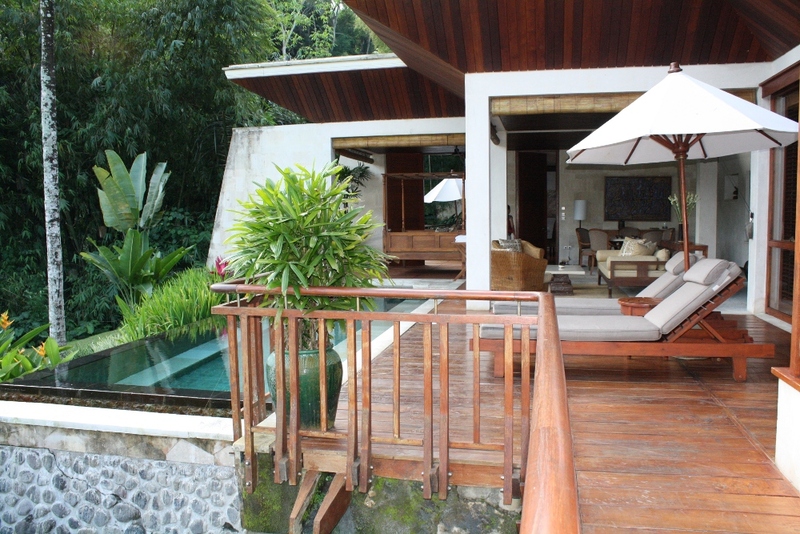 Each villa has its own swimming pool and terrace which is surrounded by trees and rice fields. The Ayung river runs right through the valley where the resort sits and the serene river view can be enjoyed from the hotel’s lobby, swimming pool and restaurant. If you’ve never been to Bali, you might wonder how long it takes to fly from US (East Coast). Well.. depending where you live, and what airline you choose, you might spend as fast as 18 hours (this gets you to Singapore only, from there you will spend about 1 hour flight to Denpasar Ngurah Rai International Airport, Bali) to more than a day. In my opinion, the best airline available so far is Singapore airline. With a bit of extra money, you can fly from Newark International Airport to Singapore, non stop 18 hours, in all business class layout Singapore air A340-500 (they call it Economy plus). Another way is to fly Singapore airline in-direct flight from John F. Kennedy International Airport (New York) to Singapore with an hour layover in Frankfurt. The first leg JFK-FRA will take about 8 hours. The second leg, FRA-SIN, will take about another 12 hours. There are more other airlines which fly to Bali; such as China airline, Cathay Pacific (via Hong Kong), Continental, Japan Airline, American Airline, and many more. You may want to compare both price and total time it takes to get to the destination, before you decide which airline to choose. Go to a very useful website http://matrix.itasoftware.com/cvg/dispatch to compare prices and total flight time from various airlines. You may also go to my website www.DoyanTravel.com and click on “Flight Search” under “Travel Tool”. As the date is getting closer, I’m checking all the necessary items, especially proper documentations that I need to bring. There are only 2 most important things on top of the list. A valid passport that is still valid 6 months after the departure date, and a visa entry to country of Indonesia, where island Bali is located. One good news is US citizens can obtain visa on arrival at various Internationl airports in Indonesia. This visa entry is good for 30 days visit and it costs about $25 per visa. Bali’s airport, Ngurah Rai, located in Denpasar, offers visa on arrival service at the location. You may also obtain visa at Indonesian consulats through out United States. Check out my website http://doyantravel.com/index.php?option=com_content&view=article&id=72&Itemid=94 for more information about visa entry to Indonesia.